Portable outboard tillers are ideal for aluminum fishing boats, jon boats, utility boats, pontoon boats, and even for sailboats when there's not enough wind. They're easy to operate and simple to install. Besides being light and compact to transport, new portable outboards are becoming known for being quiet, reliable, and fuel efficient. Horsepower is likely one of the first things you'll find yourself considering when shopping for an outboard motor, but more horsepower isn't always better. Horsepower must be chosen based on the size of the boat. If you have a small boat with a large engine, it'll cause the boat to be less stable, and the added power can cause stress and damage to the transom. In the same respect, having too small of an outboard on a larger boat can burn out the motor due to increased drag and excessive demand. Matching your motor size to your boat size will provide stability and reliability. Refer to the National Marine Manufacturers Association Certification Plate inside the stern of your boat to find its horsepower rating. This will tell you the largest size motor your boat can handle. The transom of a boat is the part of the hull (backend) where you mount your outboard motor. It's a very critical part of the boat, because the entirety of the thrust and momentum from the motor will be transferred to the boat via the transom. To measure the transom height, you need to measure from the top-center section (where you attach the portable outboard motor) to the bottom-center of the hull. 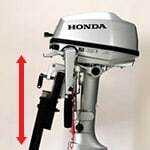 When shopping portable outboard motors, look for their transom height. When mounted to the proper sized transom, the shaft length should be approximately the same as the transom height, putting the prop just below the boat where it can optimally pull water from underneath the boat and push it behind it. If you've driven tiller-style outboards in the past, you may have experienced a recoil starter. Older recoil-start engines could be difficult at times, but today's recoil-start engines are much easier to start by hand. Nevertheless, if you want a quicker and easier start, some portable outboard motors today feature electric start. Electric start allows you to get your motor going with the push of a button. So when you're drifting in the wind, about to wash into some rip-rap, you can simply press the electric start button and get away from those rocks. For better performance with heavy loads, some motors feature a high-power thrust prop. 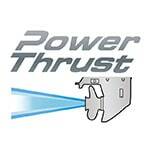 The high-power thrust prop is designed to produce more thrust, especially in reverse. This increased thrust results in better maneuverability and performance for heavier watercraft like pontoons and larger aluminum boats, so you'll have an easier time backing away from a dock and navigating against wind and current. 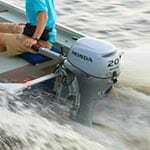 Some portable outboard motors feature power tilt. This is a great feature for larger motors that may be difficult to manually tilt. There are a few reasons for tilting your outboard. When you're retrieving your boat at the boat launch, you'll want to tilt it up to avoid scraping it on the ramp during retrieval. After you launch your boat, you'll need to tilt it down into the water. You may also need to tilt your motor up when entering an exceptionally shallow area, then back down as you return to deeper water. Do not use power tilt while the prop is engaged and the boat is in motion. This could cause serious damage, as power tilt is not designed for this purpose. To trim the motor up or down while in motion, your motor must feature power trim, not power tilt. 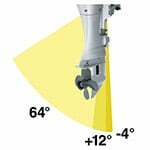 The alternative to power tilt is manual tilt, which consists of a lever that locks/unlocks the tilt function so you can manually tilt the motor. This can be tricky if your outboard is heavy, so power tilt is a feature more commonly found on larger outboard motors. Portable Outboard Motor Buyer's Guide.. Our Power Equipment Direct how-to library can help you learn about How to Prepare a Boat for a Hurricane, Official Photo Contest Rules and What to Do When Your Engine Fails.